Our staffing has remained virtually flat during the last 10 years and this has resulted in harried staff and cuts to hours. What we hear from patrons more than anything else is a request for more open hours. 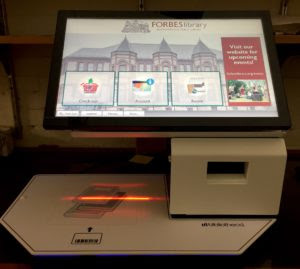 Forbes Library’s hours are on the low end for a community of our size, which makes it particularly difficult for people working traditional hours to access the library. In scrutinizing our processes, we have identified self-service checkout machines as one way to use technology to stretch our resources. They also have the potential to allow us to stagger our existing staffing to regain some of our lost hours, and to give our staff the opportunity to offer more personalized service to our patrons. We want to be able to provide reading suggestions, walk patrons to where they need to go in our beautiful but confusing Victorian building, and develop new programs for patrons to enjoy. The self-service kiosks provide on-screen instructions and staff will be available to show patrons how to use the new system. As an incentive, everyone who uses the new system in August will be entered in a drawing to win prizes, including a $100 Northampton Gift Card. Another change that patrons will notice is that items on hold will be moved out from behind the desk so that patrons can retrieve them for themselves. They will be displayed in such a way as to protect the anonymity of our patrons. Patrons will still have the option to pick up holds behind the desk, and to have a staff member check out their items. We are committed to providing high quality and personalized patron services that are delivered how and when our patrons need them. We hope that the new self-service initiative will be a pleasant one for those who choose to use it, and wish to assure you that staff will continue to be available to assist you at all times. For more information and FAQs, please view https://forbeslibrary.org/selfservice.